Butterfly Farm @ Cameron Highlands, Malaysia - Always Travelicious ! It is magical at the Butterfly Farm in Cameron Highlands with a plethora of butterflies doing staccato dances on the flowers, or simply resting on leaves. If you are lucky, you can even get them to be really really close to you. I think my trick here is, I wore super bright shoes and attracted the butterfly to linger. I had a natural instinct to almost wave it away as it was a bit ticklish but good thing I didn’t and manage to capture this butterfly having fun with my shoe! A bit of a daze actually when so many butterflies are flying all over . But there are some good opportunities to observe them close as they don’t seem to mind humans at all. While the butterflies are the main attractions, there’s also a bit of insects and reptiles. An interesting one is the walking stick insect and moving leave insect. The moving leave insect is hard to spot – I searched high and low trying to look for the insect but only managed to spot the moving stick insects, which are a little easier to spot because you can see the tentacles. There’s also a section with snakes but sorry, no photos of snakes because I am horrified by them so I stay far far away from them! Here is the main entrance to the farm. 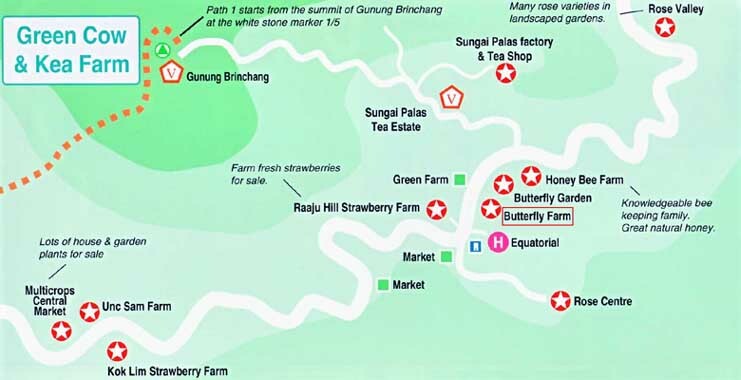 Address: 43rd Miles, Kea Farm, 39100 Brinchang, Cmaeron Highlands. Admission: RM 5 per adult, RM 3 per child.